Co-owner Erik Lomen and Kathleen Lomen show off Cap N’ Stem’s library-like incubation stacks. 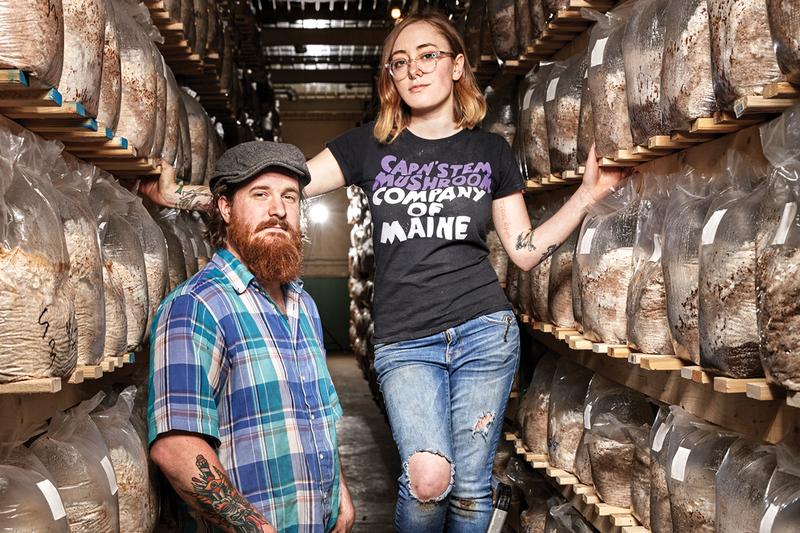 In a central Maine warehouse, the fungus–loving partners of Cap N’ Stem are running Maine’s weirdest farm. 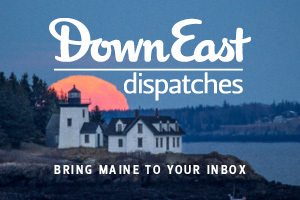 Look for the pile of sawdust.” So reads the email telling me how to find Cap N’ Stem mushroom company among the tenants of a gargantuan warehouse off Route 126 in Gardiner. Sure enough, the operation — tucked between a commercial whoopie pie bakery and somebody’s large collection of Ford Fantoms — would be easy to miss if not for that sawdust heap. It’s the only hint of what Cap N’ Stem co-owner Mark Robinson calls “the weird stuff that happens” inside. Behind a sliding wooden door — usually padlocked — lies a cavernous, 4,000-square-foot, climate-controlled room with row after row of shelves stretching its entire length and reaching to its ceiling. 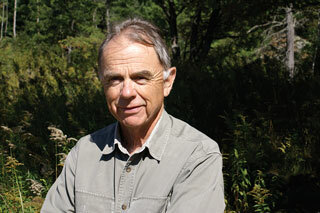 Wandering inside is like roaming the towering stacks of a big-city library, except these shelves are occupied not by books but by clear plastic bags plump with something, in various stages of incubation, called mushroom substrate — the raw material on which fungi will grow. There are some 20,000 bags of the stuff, each spaced about an inch apart. The new ones feel like sandbags; the fully aged ones are brown and firm like dense foam. 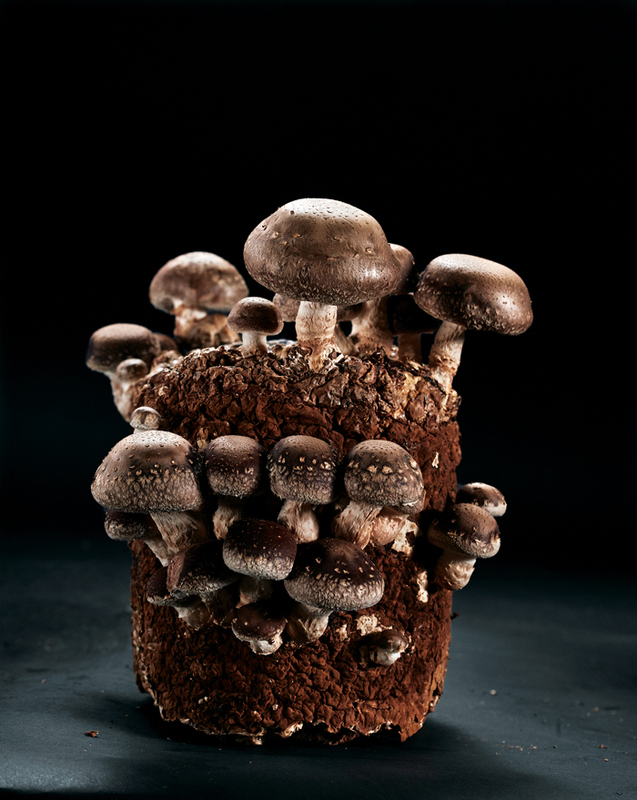 Organic substrate blocks from Cap N’ Stem burst forth with mushrooms after they’re removed from their bags and exposed to air. In the company’s stygian Gardiner warehouse facility, employees like co-owner Mark Robinson (left) and Mike Vance (right) form, seed, and incubate their specialized blocks. There isn’t a fungus in sight. Rather, the bags hold the stirrings of at least half a million mushrooms. 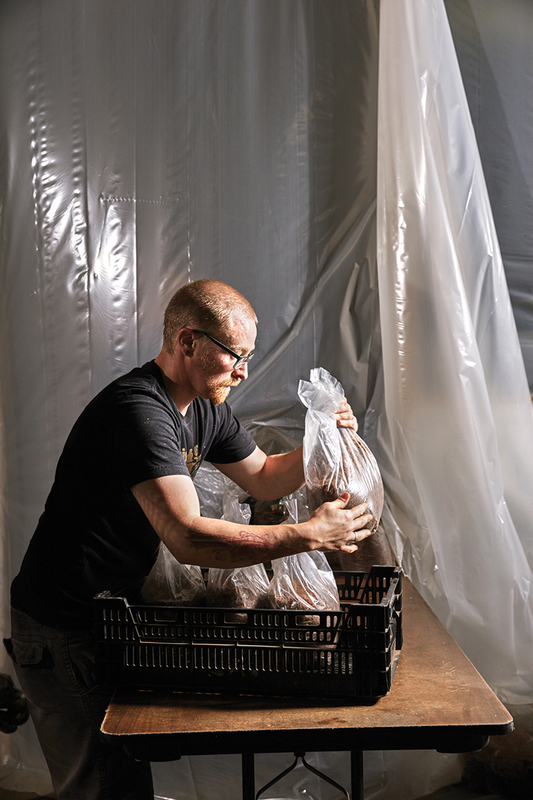 Home growers and commercial cultivators who buy a bag — $25 a pop from Cap N’ Stem’s online store — will first remove the substrate clump, then keep it moist on, say, a kitchen countertop or in a greenhouse for one to two weeks, until it bursts forth with dozens of chestnuts, lion’s manes, maitakes, or shiitakes. Especially time-consuming was the early cultivation of shiitakes, which are the most sought-after variety, but also the slowest to flower. The partners looked into buying starter kits, but couldn’t find any that met their stringent organic standards. So they decided to create some themselves.  Maine has several mushroom farms, but Cap N’ Stem is the state’s first substrate vendor. Instead of producing mushroom bedding the usual way, with manure, the Cap N’ Stem crew makes its organic substrate for shiitakes (the word is Japanese for “oak mushroom”) by mixing red-oak sawdust, obtained from a lobster-trap manufacturer in Jefferson, with wheat middlings from Skowhegan’s Maine Grains and other northern New England mills. The blend is moistened and churned in a massive red steel box, measured into plastic bags fitted with special filters that allow it to breathe, then loaded into a metal steam box for a 16-hour ultra-pasteurization process. From there, the bags go into a plastic tent the size of a small house for cooling and inoculation. 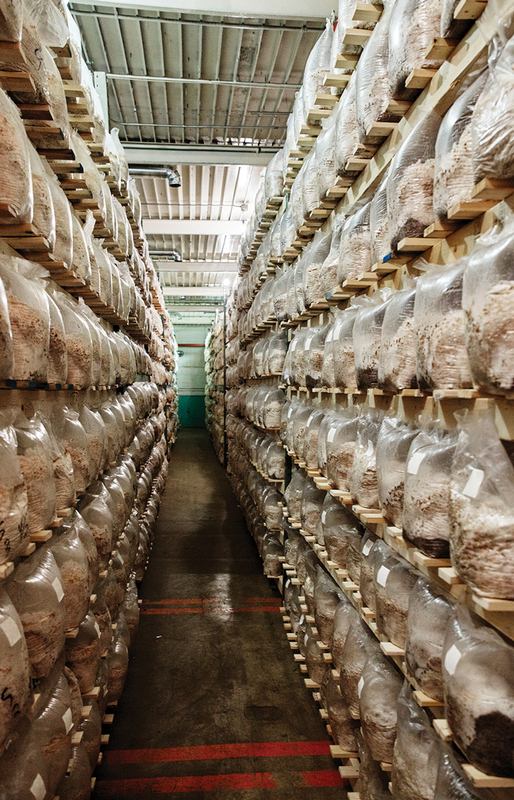 Once cooled, each bag is fed a tablespoon or two of spawn (a substance inoculated with mycelium), typically sourced from North Spore in Westbrook, then it’s sealed and moved into the climate-controlled mycelium farm, where it incubates on the shelves for up to eight weeks, slowly turning brown and firm. Mycelium produces heat as it grows and colonizes substrate, so huge fans and an elaborate ventilation system work to maintain an even temperature in the big room. Customers receive a firm block along with instructions for humidifying it to trigger growth: refrigerate overnight to “shock” it, then place it on a plate, rinse daily with cold water, and await the arrival of delicious mushrooms. Once a block is fully harvested, it can be “recharged” for a second flush if it’s allowed to fully dry out, then submerged in cold water again. Cap N’ Stem switched from growing mushrooms to selling kits just over a year ago and moved in February from Westbrook to the larger Gardiner facility, a former mill. 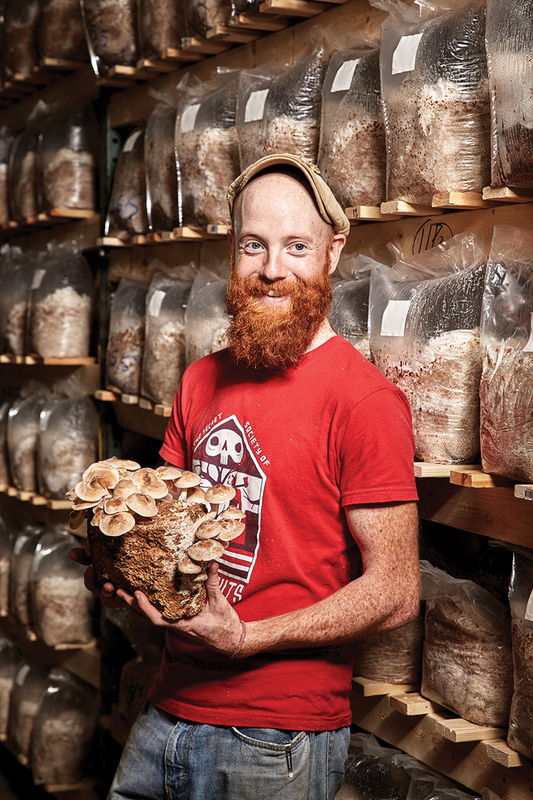 This summer, the partners began planning an expansion of the mycelium farm room and started talks to take over another 10,000 square feet next door. For Robinson, the growth is welcome, if bittersweet. On the upside, now the Cap N’ Stem team gets their weekends too. On his time off, Robinson likes to take his son mushroom foraging. 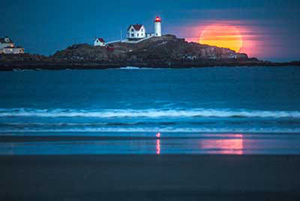 See more Making It in Maine! Just based on that the design of her shirt is a Black Sabbath reference makes me love them. Just based on that the design of her shirt is a Black Sabbath reference makes me love them!